We have been working on the 3D Material Concepts project for just over 3 weeks now. The software is really amazing and the effects and detail and high level of designs that can be achieved from using this software are unbelievable. I think it will take time to be able to gain a much clearer understanding as to how this software works, however the effects and products which can be achieved by this is very exciting. 3D Studio Max is generally used within Advertising and films, each single design is captured in stages and then recorded which results in a movie shot of each stage. Although using the movie aspect within this project will not be necessary, it is still an interesting element which could be used within the degree show presentation. I have found this session really difficult to understand and think it will take a matter of self learning and understanding to ensure i fully understand and keep working over the features we have been taught today. 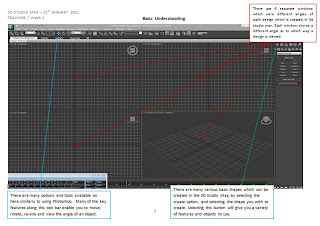 Using the skills we have been taught today, I have noted the main learning features on the following pages, indicating key elements, which will enable me to learn, adapt and apply into a design mode for my final design. 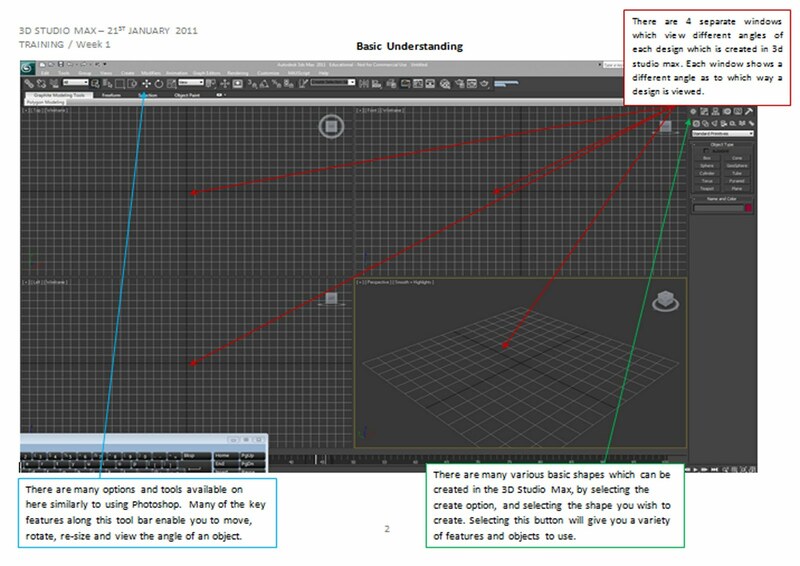 Red: Indicates 4 separate windows which view different angles of each design which is created in 3d studio max. Each window shows a different angle as to which way a design is viewed. Green: Indicates that there are many various basic shapes which can be created in the 3D Studio Max, by selecting the create option, and selecting the shape you wish to create. Selecting this button will give you a variety of features and objects to use. Blue: There are many options and tools available on here similarly to using Photoshop. Many of the key features along this tool bar enable you to move, rotate, re-size and view the angle of an object.